Garoa Hostel is located In a quiet street 250 meters from the subway in the most vibrant area of Sao Paulo with countless bars, restaurants, cultural centres and nightlife for all tastes. We offer cozy rooms with comfy beds for you to relax in after a tiring day out! Check out our amazing garden with a bar where you can enjoy a cold beer and a real Brazilian barbecue! Garoa is just a 10-minute walk from Vila Madalena. These two neighborhoods make up the most exciting area of Sao Paulo, with an excellent bars, restaurants and nightclubs for all tastes, especially for those looking for forró, samba, jazz and rock! Cultural centres such as Tomie Ohtaki Institute and Sesc Pinheiros are our neighbors and offer plays, concerts, shows and exhibitions, and most are free! Benedito Calixto Flea & Design Market is within walking distance and it is the perfect place to have a wander and find some unique souvenirs to remember your time in Brazil. Villa-Lobos Park is another landmark of west Sao Paulo, which it’s also very near the hostel, about 10 minutes cycling through Sao Paulo’s newest green cycle lane! 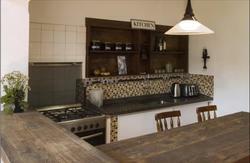 - Barbecue place for you to experience a truly Brazilian one! Our staff speak English, Portuguese and Spanish and is always ready to help you make the most of your trip! Tour and trips can be arranged at our 24 reception desk and you can also get helpful tips about the city. Free typical Brazilian breakfast gives you that spur of energy to explore the city! By bus and metro: Look for the Airport Bus Service’s signs at the airport’s main exit. Buses from there will drop you off at Tatuape Metro (red line), and from there you need to take metro (stopping at Republica to switch lines) to Faria Lima Station on the yellow line. 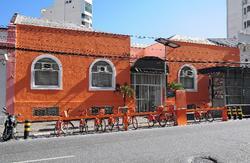 The Garoa Hostel is it only 250 meters from the Faria Lima station. When leaving the station, go to the exit located at your right and walk to the church direction, in front of it, you will see a street (Fernão Dias Street) at your right. It is not the street on the church side! Walk one square and turn to your left at Guaiçui Street. The Garoa Hostel is it on the right side in the same street, at number 72. The whole journey takes about 1:10h and costs R$ 7,45. By bus: Leave the airport and walk to your right to the first bus stop. Take the 576M-10 bus (it runs every 10 mins) which will take you to Faria Lima Av in about 1 hour. Get off at Faria Lima Av, next to Metro Station and walk to the hostel, which is 250 meters from there: When leaving the station, go to the exit located at your right and walk to the church direction, in front of it, you will see a street (Fernão Dias Street) at your right. It is not the street on the church side! Walk one square and turn to your left at Guaiçui Street. The Garoa Hostel is it on the right side in the same street, at number 72.